The satellites launched on a Long March 3B rocket at 1910 GMT (3:10 p.m. EDT) from the Xichang space center, a facility in Sichuan province in southwest China, according to a release from the China Academy of Launch Vehicle Technology, the state-owned contractor for Chinese rockets. Liftoff was at 3:10 a.m. Beijing time. The 187-foot-tall rocket targeted an orbit with altitudes between 150 miles and 13,000 miles, and an inclination of 55 degrees to the equator. Chinese government agencies declared the launch a success, marking China's 12th space launch of the year and the 50th mission worldwide to reach orbit in 2012. Each spacecraft has on-board thrusters to raise its orbit and reach a circular altitude of about 21,500 kilometers, or 13,359 miles. The satellites launched Tuesday are the 14th and 15th Beidou spacecraft in the program. 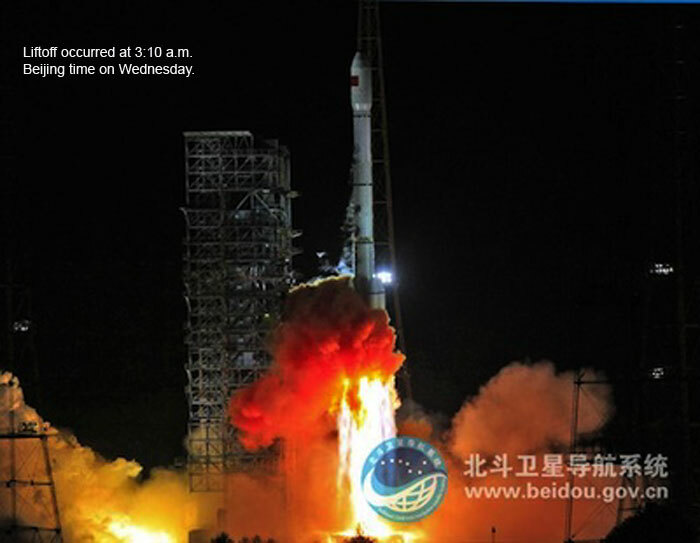 One more Beidou satellite is scheduled to launch into geosynchronous orbit before the end of 2012 to complete a regional network with navigation services to China and neighboring countries.